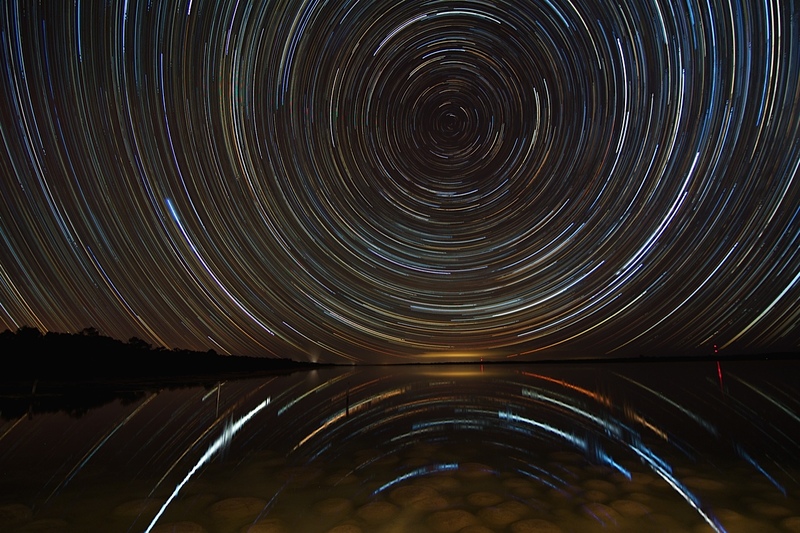 Star trailing is an interesting form of photography. People tend to like or hate it. I haven’t done a star trail since last year, with most of my astrophotography imaging based on the milky way and trying a little DSO with a 70-200mm. Single long exposure using bulb mode. The disadvantages of this method of star trails are – less trails and potentially more noise (due to long exposure). The sensor tends to heat up the longer that the shutter is open for and may result in more noise. With using this method – I would open up the aperture as wide as possible first with a high ISO and work out what is a “correct” exposure – and then start multiplying out the shutter to match the number of stops. For example 30s @ ISO 1600 = 60s @ ISO 800 = 120s @ ISO 400 = 240s @ ISO 200 = 480s @ ISO 100 = 960s @ ISO 50 and can keep multiplying it out for a reduction in the aperture. What will happen though is that the smaller the aperture and lower the ISO – the less star trails you will have – so the longer the shutter – you may end up only with half a dozen trails. Remembering that all light is additive the more longer that you have the exposure, so eventually it will get brighter and brighter. The below image is 10 minute s@ f2.8 ISO 200 11mm on a canon 550d. I have kept the brightness the same but reduced the highlights due to the light pollution. 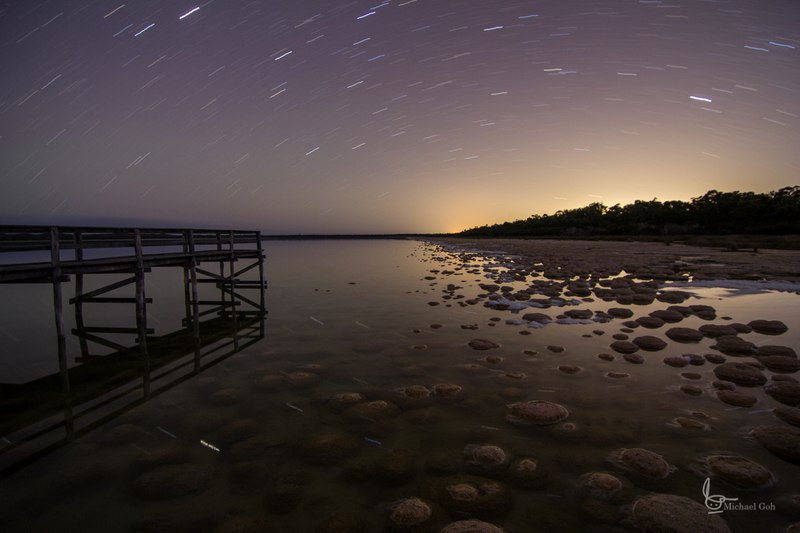 Many star trails that I do are a couple of hours long. Stacking by taking multiple images and processing by way of software like starstax or photoshop (using lighten blend mode). The advantage of doing it this way is around having much more stars and more control over the overall composition. For example if you’re relying on a 60 minute exposure to get the right lighting over the landscape and then something like a car’s headlights paints the scene, then you can still recover it with stacking. Also with stacking you can amend items to create comet trails and other effects. Turn off image stabilisation (canon) or vibration reduction (Nikon) – being mounted on a tripod there isn’t any need for it. What happens is that IS/VR can actually introduce vibration into the shot as it tries to compensate for nothing. Have long exposure noise reduction turned off – this takes an immediate additional shot with a closed shutter and applies a dark frame for noise reduction. The problem with this is that it goes for the same exposure – so a 30s shot with long exposure noise reduction will close the shutter and take another shot immediately – being a total of 60s. Once it gets dark – make sure you take a few frames and review to double check that the stars are moving in the way that you want. This is to avoid finishing the night and realising that the whole composition is wrong. It’s better to lose the foreground (dusk) image and recompose if need be at this point. Could always just do a long exposure foreground shot or light paint. I have gone from night to dawn before as well. Intervelometer – this is a cable release or remote that you can program in the number and duration of shots – Many Nikon cameras have an in built intervelometer. Some more recent Canon’s (G16 and S120) have a “star” mode that does the stacking for you. Have a suitably large memory card – note if you’re imaging for things like the milky way and want to star trail as an addition, then you’re probably imaging 30s exposures or similar. I’ve been quite happy with doing dedicated star trails with 60s-120s exposures to reduce the number of frames taken. It’s important to visualise what you want since you won’t know what the end product really looks like until you’ve finished. If you’re in the northern hemisphere it’s easier to get the celestial pole – it’s Polaris. In the southern hemisphere it’s a bit more complicated because you can triangulate it between 3 stars. Having said that, since I tend to take a shot before it gets dark (for the foreground) – the stars aren’t visible yet. To determine the location of the celestial pole I use a compass (for south/north – or whichever way you want). For my location – generally the celestial pole is around 30 degrees altitude. Since I usually use a lens that is around 95 degrees horizontal width (if I’m doing a portrait star trail) – then I know roughly where in the frame it needs to set. Also – if you outstretch your arm and have fist over fist – each fist equates to 10 degrees. Don’t be limited to having the celestial pole in the frame. I just personally like it that way. Settings – it depends on how many stars you want. Generally speaking the higher the ISO and the wider the aperture, the more star trails you will have (how crowded do you want the sky?). Depending on ambient light – you won’t really get more star trails above 30s exposures (depending on focal length). To save space on the memory card I’ve run 1-2 minute shutters before. Also note that the higher the ISO – many cameras will start to bleed out and lose colour. With higher ISO you can possibly start adding up some additional noise. You can take dark frames and integrate into starstax to reduce the noise (I haven’t really needed to). Dark frames are taken at the same time as imaging with the same settings with the lens cap on – this is because the noise pattern tends to be based around the environmental conditions at the time. Taking 10-20 dark frames should be a reasonable amount. With starstax it’s pretty easy to just load in the images, use lighten mode (adds all the lightest points of each image) and choose if you want comet trails or not. There is also a setting to extend the blending to assist with continuous trails (just in case there is a slight gap between trails). I prefer to import into starstax as tiff files and then export the final image as a tiff rather than using a jpg. In photoshop I will process in the same way as any landscape image. So there maybe some difference between the land and the sky. The sky (the star trails) will tend to increase saturation to exaggerate the colours – but that’s just an artistic decision. I haven’t processed any star trails for awhile – I’ve learnt so much since my last trails in early December 2013 in both visualisation and post processing abilities so will hopefully do some more before the end of the year. Taken with one frame at dusk and then continue taking frames without moving the camera. Combined both into starstax. With the star trails here – I graduated them by processing the stars in batches of 5% of the total and then process in PS with a black background and with the front layer (the stars) changing the opacity by 5% each time and then re-stacking in starstax. Now starstax has that ability to do so with comet tails. However manually editing will allow for different control. Some people take the dusk image as a HDR. Star trailing over still water at the Thrombolites. In this instance a preliminary frame was taken when it was dark and light painting the thrombolites. I didn’t graduate the trails like the previous example because the reflection in the water is lessened. Another star trail at the Thrombolites – this time with moon lighting. The moon was so bright that I ended up doing 15s or less frames otherwise it was going to be overblown. The trails have been graduated as described before. 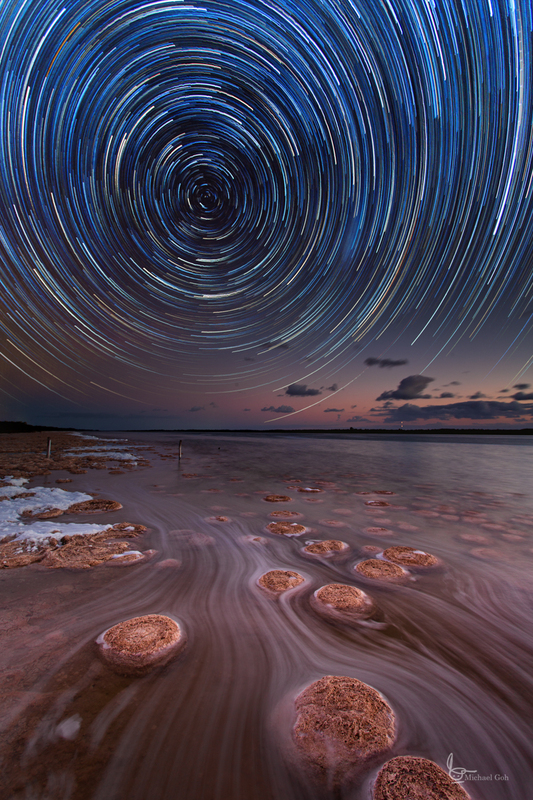 In this instance the “head” of each of the star trails is processed using Topaz stars. Star trailing at the Thrombolites again (see a common theme here?). This time taken in portrait format as I wanted more foreground in the frame. Slightly off centre with the horizon. Again – I imaged the foreground first – watching the flow of foam creating trails of their own. Star trails with a milky way long exposure blended into it – taking the star trails and then changing the settings to expose for the milky way – typically to blur it as well. Side ways star trails – facing east or west. Vortex star trails – I know how to do it, but have been to busy imaging other things at the moment. 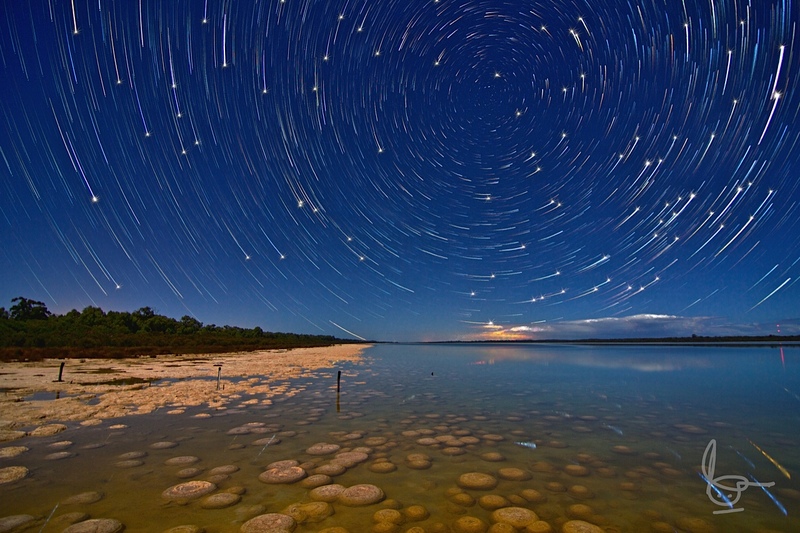 360 degree star trails – frequently done with multiple cameras or effectively doing a 360 degree panorama while trailing. There are multitudes of variations that can be done – don’t limit yourselves by other peoples imagination. Sir, If you would allow me a question, please – did you direct your camera northwards or to the south ? Thank you in advance. Sorry, I want to add that my question is specifically related to the startrails timelaps photos.